Note: The app is still rolling out worldwide. Check back soon if the links don’t work for you! Announced during Apple’s October event, Pixelmator for iPad ($4.99) is an important stepping stone in the iPad’s history. The Mac app is regularly featured by Apple as an exemplar app in the Mac App Store and it is clear Apple wants to use Pixelmator as a ‘trophy’ app in the same way. No doubt this app (aside from games) is one of a handful that will directly benefit from the A8X performance gains. I tested the app on an iPad Air, although the app technically supports all the way back to iPad 3, even some operations on the Air felt slow. I would be a bit cautious if you intend to install it on one of Apple’s older tablets. As a 1.0 release, the depth and breadth of this app is staggering. There are a myriad of effects, painting brushes, color adjustments and other features to help edit and create images. 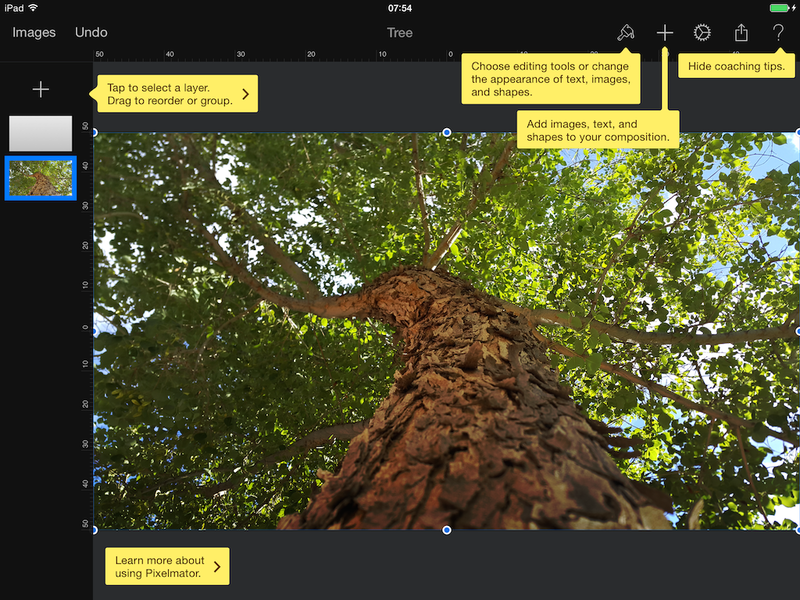 The vast majority of the Mac app’s functionality have been ported across to the iPad with a touch-friendly interface, including advanced editing options like layer styles. There are also some template options that aren’t currently included in the Mac app to appease the ‘Photo Booth’ selfie crowd. The main Pixelmator UI takes much inspiration from Apple’s iWork suite of apps. The ‘Get Started’ dialog looks almost identical to the first-launch experience of Pages, for instance. Pixelmator features the same gallery view of documents, which emulates the Home Screen behavior of drag-and-drop to create folders. This grid shows documents that reside in Pixelmator’s iCloud container. The + menu can import from iCloud Drive, iCloud Photo Library or from the local Camera Roll. Be prepared to tap these menu items a lot. The main canvas UI also takes many cues from Keynote. The primary toolbar uses the same ‘Format’ inspector as the iWork apps, alongside the memorable add, settings, sharing and help menus. Tapping each icon opens its respective popover with options. The contents of the ‘Format’ menu vary based on context and your current selection and is where you spend most of your time. Once again, with the controls you are not going to be a surprised by what you see if you have used iWork before. In fact, when using this app, you start to forget that this app isn’t made by Apple at all. Even the app icon is scarily similar to iPhoto. I like the structure of Apple’s iWork apps. Most third-party developers apps have shunned the iWork navigation in favor of other custom control flows but I’m not really sure why. In many ways, this is great. If you are familiar with Pages or Keynote, you will be very at home with Pixelmator. The developers have even replicated Apple’s yellow tooltips UI if you need additional guidance. Unfortunately, this design approach breaks down in the edge-cases when Pixelmator hasn’t mimicked Apple’s implementation completely. For instance, you can’t one finger rotate images or bunch layers into a group to move multiple items at once. As it looks like iWork, you expect these things to work, but they don’t … which is disappointing. Most of these are ancillary annoyances but one key omission is the lack of a ‘constrain resize’ gesture. This was a frustration on several occurrences during testing, as I could not find a way to resize a rectangle in proportion (ie: a square shape) without manually fiddling both axes. Naturally, adopting the iWork UI also means you adopt its flaws. In landscape, I think the inspector popover would be better presented as a persistent sidebar. Right now, in both orientations, you have to endure an extra tap to open inspectors when you switch objects. In portrait, this is fine given the aspect ratio but something better could be made for landscape orientation. This seems like an obvious improvement for future updates. Overall, I think the iPad interface is great. Although I feel like I’m tapping excessively, everything is straightforward and logically laid out. It is much less overwhelming than the Mac app which presents multiple onscreen panels simultaneously. The iPad experience is one context at a time, in procession (either through a popover or a modal view). Vitally, this is consistent across the app. A vast array of different image operations are handled by the same, familiar, navigation patterns. So, what are these features exactly? Adjustments fit into four main categories; effects, color adjustment, painting tools and retouching tools. Effects and color adjustment apply to the selection — blurs, bokeh, vignettes — whereas the brush-based tools are selective based on your finger touch. Effects show small previews along the toolbar — tapping on each applies the effect above. Some effects have parameter settings that appear when you tap through, but others are more basic. Over time, I’m sure Pixelmator will add more customization options for each of the effects to match the desktop counterparts. Pixelmator for iPad makes heavy use of this rotary dial UI element, acting as both a color wheel and a slider. You can quickly move your finger in circular motions to ramp up effects with momentum, similar to an iPod clickwheel. As mentioned above, selecting an area first before entering the effects mode will constrain the effect to just the desired selection, otherwise it will apply to the whole layer. In this example, I used a freeform selection tool to separate the foreground moss from the background and only colorize the foreground moss to a purple shade, leaving the rest of the image unaffected. Retouching options are brush based, so you trace your finger over the affected areas to apply the effects. This encapsulates the saturation, desaturation, red-eye, smudge, and repair adjustments. 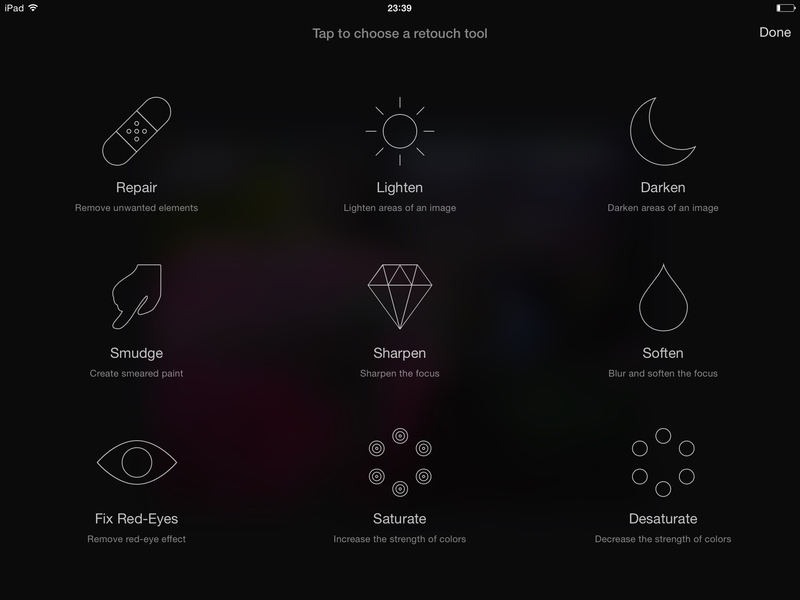 Each tool is presented in a pleasant grid view, just tap to swap between tools. The iconography is flat and basic to fit iOS 8’s wider aesthetic, but are well-balanced to maintain the feeling of sophistication a pro app should have. I was impressed with the repair tool. You just highlight a screen portion and it uses surrounding content to remove the offending region. This works better than you would expect it would, but obviously it’s not flawless. I think the best way to characterize its accuracy is to say I was surprised at the output. The team say it uses the same repair engines that Pixelmator for Mac introduced in 3.2. It does take a good chunk of processing time and is one of the few instances where you have to wait for progress bars to complete. Alongside the photo editor elements, Pixelmator also includes an array of brushes and shape tools so that you can actually draw works of art onto a blank canvas. Pixelmator includes support for pressure-sensitive Wacom Bluetooth styli, which is probably recommended if you want to do serious painting. Lacking one of these, I tried to make a pretty picture in ten minutes. You can see the results in the slideshow. Combining some shape layers and freeform brushes, I made a decent landscape very quickly. For a novice artist, I was happy with the resultant image and convinced that someone with better drawing talents could create fully-fledged art pieces with this app. This is what most serious photographers will use the most, to tweak color balance and hues. When opening color adjustments, a new sidebar docks to the side of the screen. 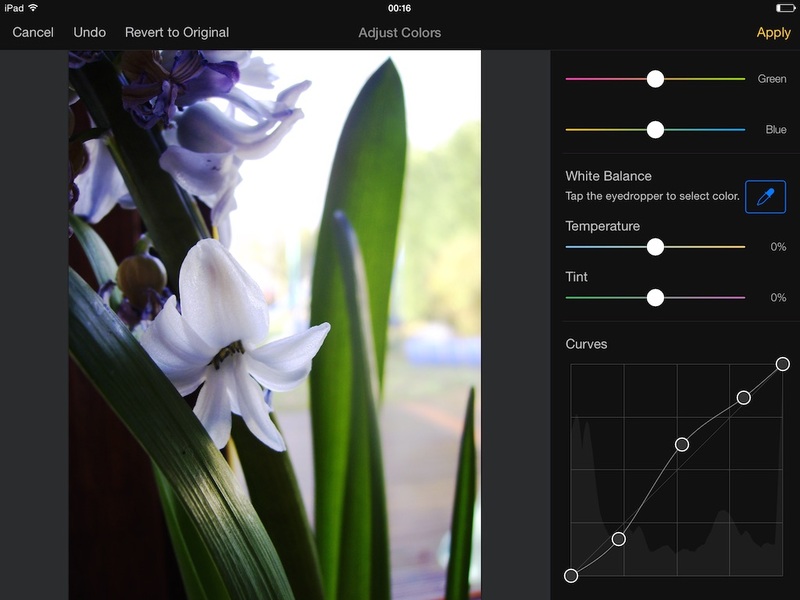 You can adjust white balance, color temperature and even manipulate a color curves graph directly, adding control points as necessary. A live histogram is also presented showing an accurate up-to-date graphical representation of the photo’s colors. This mode is very competitive with desktop apps in terms of its feature set and I can see professional users download Pixelmator just for on-the-go color correction. Pixelmator includes a variety of template options which aim to create throwaway things like quick collages and basic greetings cards. The collages and framed images are templates that are primed for quick upload to Instagram or Facebook. Unfortunately, there is currently no way to adjust the masking when you replace the template images with ones from your library. This means attaining perfect compositions is impossible. Still, it’s meant as a quick feature and it certainly delivers in that area. The templates are pure Pixelmator projects underneath, so you can still add text and other layers on top if you want to customize the appearance in that way. Whether these novelty features are appropriate for a professional photo app is a different question entirely. Once you are done creating your images, you can export with a tap. You won’t be surprised to find out that the dialog replicates iWork once again. Pixelmator lets you send the raw Pixelmator file format directly, or export to Photoshop, JPEG and PNG file formats. The latter of these will flatten your image layers before sending, obviously. You can save the image to the Photo Library, back into iCloud Drive, or export to another third-party app. In conclusion, Pixelmator for iPad is a great addition to the platform and shows how much the iPad has matured since January 2010. The main problem I have with using Pixelmator day-to-day is how to get pictures into the iPad for editing in the first place. If you are taking pictures on a DSLR, it’s still easier just to import the snaps straight to a Mac and manage them there. 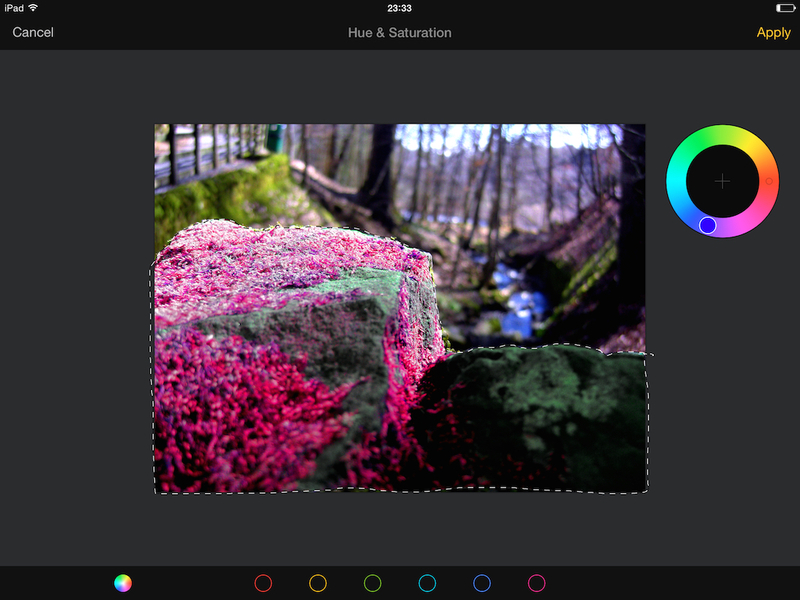 Right now, Pixelmator for iPad is best used in conjunction with your iPhone camera. Take pictures on your iPhone, edit them on your iPad, all synced though iCloud Photo Library. Regardless, at $4.99, Pixelmator is almost an impulse buy as it is so cheap. It’s very full featured and a no-brainer if you already own Pixelmator for the Mac as the app supports all modern Continuity features, like iCloud syncing and Handoff integration. It’s not a gimmick: real people could take advantage of this app for a long time. Pixelmator for iPad is a quality product that could easily be justified at twice its price, especially given Pixelmator’s reputation of consistent updates on the Mac. Everything is super responsive on an iPad Air. I can’t wait to see how it performs on the iPad Air 2. Expect to see Apple feature this app heavily in its new iPad commercials. You can download Pixelmator from the App Store for $4.99. Find out more information at the developer’s website.